WarGup is a Windows Service that will lie dormant and only wake up as often as you'd like to check if there's a new patch available for World of Tanks, World of Warplanes and World of Warships. It requires ~1.5 MiB memory to run and uses neither processing power nor network bandwidth until it's time to check for a new patch - and even then it's not noticeable. When a new patch is available, a popup window will appear to notify you about it and the download will start in the background. You can continue working with your computer as normal. If you abort the download by shutting down your computer or stopping the WarGup service, the downloading process will continue from where it stopped the next time the computer or the WarGup service is started. You don't have to be logged on for WarGup to work - the only requirement is that the computer is turned on. When the patch is fully downloaded, you'll see another popup window notifying you about that and the patching of the game will start in the background. 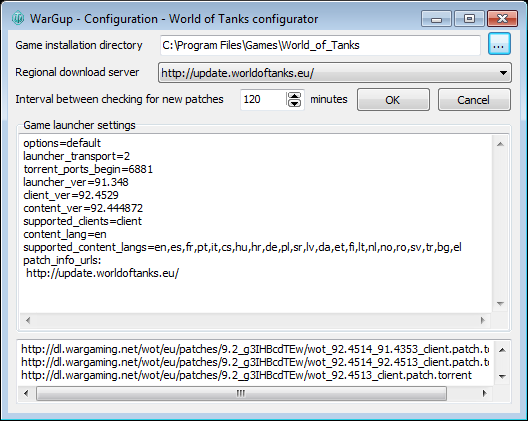 This may take some time depending on the size of the patch, but that's what WarGup is for. When the patching is done, you will get a "go ahead and play" notification. README.html The file you are reading now. 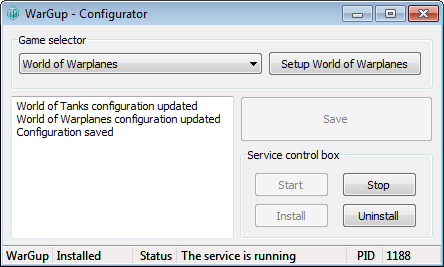 WarGconf.exe The service configuration and installation program. WarGup.exe The actual program that will run in the background once installed. The game configuration form will open in which you select the game installation directory by clicking the ellipsis button (...) and then browse to your game folder and click OK.
You will now see some of the current settings for your game, such as the version of the game, the game launcher and the game content. You'll also see some URL:s to game patches. If your game isn't updated - one or more of these will be downloaded once the service has been installed. When that is done, set how often you'd like WarGup to check for new patches for this particular game. The default is to check once every 120 minutes (2 hours). You will now return to the main form of the WarGup configurator where you now can click Save to save this configuration - or configure another game. When you've configured all the games you'd like WarGup to keep updated, click Save and then Install. That's all - WarGup will now keep your configured games updated while you do other important things. You can now close the configurator and forget about it until WarGaming releases a new game. Start WarGconf.exe and then click Uninstall. The service will be stopped and uninstalled. First, uninstall the service (see Service uninstallation above), then remove the WarGup folder. WarGup does not create any registry entries or files anywhere else (other than the downloaded game patches) so this is all it takes. Please send me an email if you have any questions or ideas for improvements.